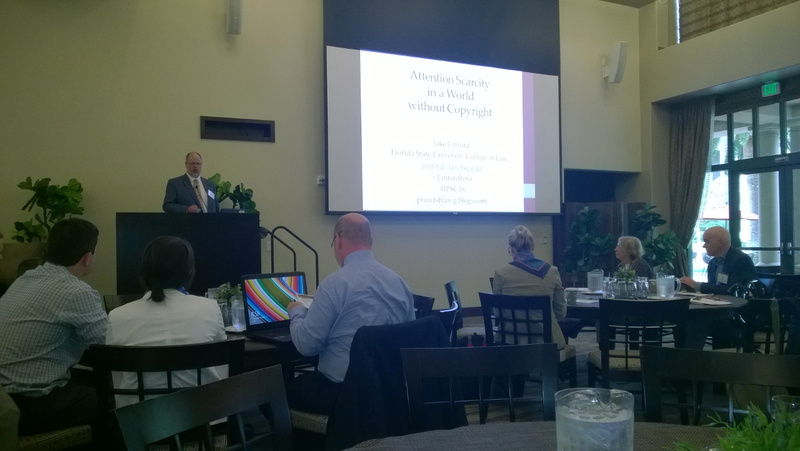 I had a great time, back in August, at the 16th Annual Intellectual Property Scholars Conference IPSC held this year in Stanford Law School. It is the second time I take part in the IPSC and as with the previous time as was impressed by the size and quality of the conference. Here’s a copy of the full conference programme. As is often the case when I give a talk about the French graduated response scheme and the HADOPI, I am struck by the fact that most, if not all, of the audience assumed the scheme had been scrapped ages ago when in fact it is now in full swing. Below is the abstract to the presentation. And hopefully I will finalise a published article on the topic soon enough. Title: A soft stick and a bitter carrot? Assessing France’s graduated response scheme against piracy and state interventionism in the marketplace for copyrighted content. Over the last decade France has been one of the most pro-active countries in fighting copyright piracy. In particular, it has devised an original two-pronged strategy aimed at small scale infringement. The first, and most well-known, prong of this strategy consisted in the adaptation of its legal arsenal in order to better punish and deter copyright infringement. The other prong of the strategy was a series of state-backed measures to improve the marketplace for legal digital content in order to incentivise consumers to choose legal products over illegal ones. This paper will assess this carrot and stick approach. The modification of French copyright law to better combat piracy has received a lot of attention. France was one of the first countries to adapt its copyright and criminal laws to better target small-scale infringers. Alongside the existing tough criminal provisions, best suited for commercial scale operations, France introduced in 2010 a “graduated response” system targeted at casual file-sharers. Under the graduated response scheme, suspected copyright infringers receive warnings urging them to stop their illegal activities. If they remain undeterred after three warnings, they can face prosecution before a criminal court. To guarantee due process and the respect of privacy rights, the warning phase of the graduated response is administered by a dedicated independent administrative authority, the “High Authority for the dissemination of works and the protection of rights on the internet” (in French: “Haute Autorité pour la Diffusion des Oeuvres et la Protection des droits sur Internet”) or HADOPI. The HADOPI, upon receiving a complaint from copyright holders, assesses it, decides whether to send a warning to the alleged infringer, and whether to forward the case to the courts if the internet user remains oblivious to its warnings. The French system of graduated response has inspired many other similar systems the world over. Much has been said about the French system and its progeny, most of it negative. Five years on and millions of warnings later, this paper will revisit the discussion about the rationale of the system and assess its proportionality and efficiency, concluding that this worthwhile experiment is neither as dangerous nor as game-changing as often claimed on either side of the argument. The paper will also explain and assess the less well known “carrot approach” taken in parallel by the French government. France has launched a series of measures, notably via the HADOPI, to make legal content more attractive to consumers. Measures such as free music vouchers, the streamlining of media windowing or the creation of an official accreditation and labelling system for legal content providers have been introduced or mandated by the government. This paper will ask whether this prong of the strategy is an example of successful state-intervention or of failed dirigisme.